As you go down Route 1, heading south away from San Francisco, you'll pass through a tunnel south of Pacifica. 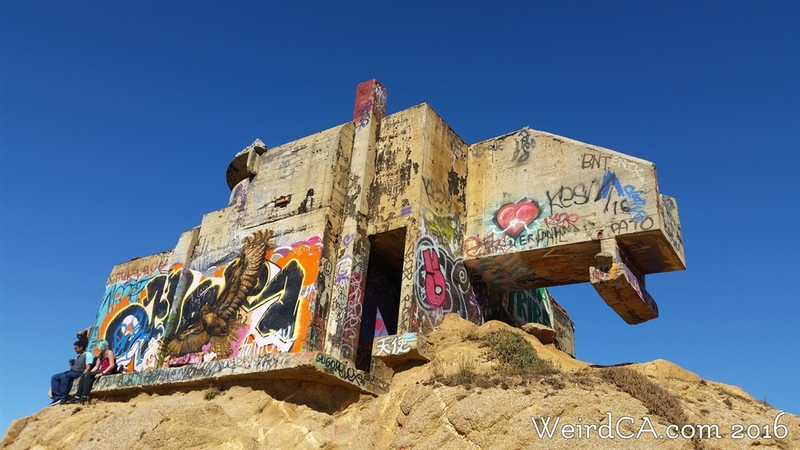 As you emerge from the tunnel, on your right, standing on top of a pile of dirt which is itself on top of a cliff that is jutting out from the coastline, will be a strange, graffitied concrete bunker. Much of the dirt under it has been dragged away, leaving the bunker base overhanging the edges of the pile of earth the tagged former military bunker sits upon. Its precarious position looks like it could slide off the dirt mound and tumble down the cliff into the ocean below. 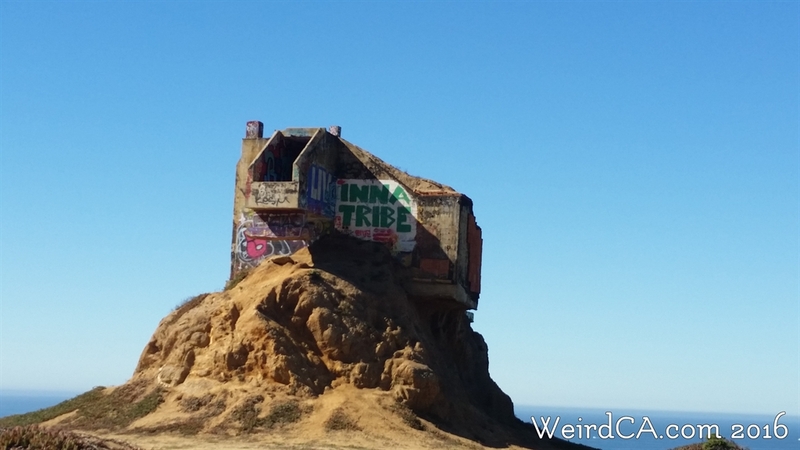 The bunker located up on Devil's Peak was built and used during World War II as part of the Harbor Defense of San Francisco. It was set up, along with other buildings, to handle military observation and triangulation. Back then the process was pretty simple. Someone was literally setup in the bunker (or perhaps one of the observation pill-boxes) with binoculars and compasses scanning the ocean. Information from multiple observation posts would be used to triangulate the location of ships and hostile units. A nearby six inch gun was then radioed which would fire upon any enemy vessels. The main purpose of the then called Little Devils Slide Military Reservation was to scan and report Japanese ships threatening the California coast. However, as radar became more advanced, however, the station became obsolete, and was entirely abandoned in 1949. The site, at one time though, had six structures consisting of three observation pill-boxes, two bunkers and an observation tower. The bunker is now up on top of a perch about ten to fifteen feet up from the ground. It turns out that the dirt along the peak and around the bunker was removed before 1970 for some sort of construction park, leaving the bunker poking up out of the cliff. The entire development was abandoned, leaving the bunker in the strange location it still currently resides in. The entire site is supposedly still today owned by a private owner, having been sold in 1983. A few other structures are north of this bunker, but they are behind a hill and blocked off by a fence. There may be three other structures located in that area. The only way into the main bunker just south of the tunnels is by a narrow slit on the ocean facing side. You would have to climb about fifteen feet up the southern side, shimmy out a narrow ledge, and then lift yourself up and through a chest high slit in the all. We do not advise doing this, although, not surprisingly, there is a lot of graffiti inside the bunker as well. The former Route 1 is now the Devil's Slide Trail, a 1.3 mile pedestrian and bicycle trail. Route 1 has been relocated just slightly to the east of the former trail, in the form of previously mentioned two tunnels that were bored straight through the mountain. Prior to the redesign, Route 1 would often be the unfortunate recipient of erosion, mudslides, and other forms of damage due to the weather. The former Route 1 is still paved, and the trail provides different lanes for hikers vs bicyclists. One day it will be part of the California Coastal Trail which will link over 1200 miles of trails to allow someone to hike from Oregon down to Mexico. Special thanks to the California Urban Explorers: Sparklepyre and Forgotten California who visited the site with me that day!